More can happen in two years in a developing country like China than can happen in a decade or more in developed countries. And given this high speed of change, the information in business books about China’s economy can go out of date really fast. That is why it is not surprising that although it has only been a little over two years since China analyst Shaun Rein released his first book, The End of Cheap China, he is back with another one. In that time span, China got a new leader in Xi Jinping, the one-child policy was significantly reformed, and Alibaba, the country’s biggest internet company, went public on the New York Stock Exchange. The End of Copycat China is a natural follow up to End of Cheap China (which we featured a review of on this blog not long ago) and looks to build upon the research he’s been doing for the past decade on the ground in China. I recently had a chance to chat with Rein about his new book and ask some questions about what he’s seen change in the past two years and, more importantly, the trends he sees influencing China’s development in the near future. Adam Mayer (AM): Your previous book The End of Cheap China asserted that China is moving up the value chain from a land of cheap manufacturing to higher-end manufacturing and services. Since then, how have your initial observations been validated? Where is China today versus when you were doing research for your first book? Shaun Rein (SR): When End of Cheap China first was released, many critics pounced on me and said that China would always be a low-cost manufacturing center. Over the last three years, however, my thesis has been proven right as labor and rents have gone up in double digits year on year in the manufacturing sector — China no longer is a cheap place to produce products. Companies like Nike have started sourcing more from even cheaper markets like Vietnam and Chinese footwear manufacturers like Huajian have opened factories in Africa. When even the Chinese relocate to Africa in search of lower costs, that is when you know there is a tectonic shift in supply chains needed. I also argued in End of Cheap China that China would not lose its manufacturing dominance because it has superior infrastructure and the necessary eco-system for manufacturing — I said that Chinese firms would move up the value chain which they have done. What might surprise people is just how fast many companies moved up the value chain. They are no longer transferring technology from western nations like Germany and the U.S. but actually focused on innovation which is where my new book begins. 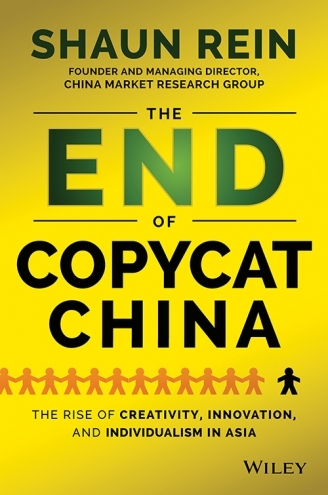 AM: The title of your new book The End of Copycat China also suggests the ‘end’ of something China is known for (intellectual property transfer in this case) as a signal for its next phase of development. Is the perception of China as a land of copycats still a reality? SR: Chinese firms were copycats for the most part of the last thirty years. The main reason was that there was so much low-hanging fruit to simply transfer technology from the West directly into China and to customize if needed for local markets. It was easy for well-connected (and corrupt) people to get land on the cheap and put up skyscrapers or secure long-term monopolies supplying various government agencies. But now that costs are so high and the public equity markets are giving high valuations to innovative Chinese firms like Alibaba and Tencent, Chinese companies are focusing on innovation more and more — it would be a mistake to discount their ability to innovate. This is a natural progression to what happening in South Korea and Japan. Yesterday I was at Lotte World Amusement Park in Seoul. From the term ‘cast members’ to Indiana Jones look-alikes, even Lotte is seemingly knocking off Disney and the George Lucas/ Stephen Spielberg franchise. Intellectual property was and remains a concern so it did not make sense for companies to invest millions of dollars in innovation because someone would likely steal it. When I interviewed top entrepreneurs in the book — and I interviewed the founders of JD.com, Qunar, Tudou for instance as well as the former CEO of Alibaba.com and an angel investor in Xiaomi — property rights and lack of enforced was an issue many brought up towards a barrier for innovation in China. That said, the situation is getting better as the government is more likely to move to protect the interests of domestic Chinese firms hurt by copyright infringement than western players. AM: Is there now a broad consensus among policymakers and business leaders in China that the country must innovate in order to continue on its path of economic reform? What are some examples of businesses or policies you’ve come across in your research that align with this goal? SR: The Chinese government has definitely set the goal of innovative businesses taking up a larger part of the economy. Local governments are setting up innovation parks, like they did with the IT parks a business generation ago. Frankly, I am not sure that these initiatives will work as great innovation tends to occur in the private sector, often in small teams of entrepreneurs who think they can change the world. Chinese bureaucrats despite good intentions often do not understand and thus do not support new technologies which can hamper innovation. That said, one sector that the government actively supports for innovation and which is seeing great growth is the bio-tech sector. Probably more than any sector I interviewed, except maybe mobile, biotech entrepreneurs were the most optimistic in China precisely because of the support the Chinese government is giving the sector from funding, equipment and opportunity to cooperate with academic institutions. Many said that the climate is better in China than in the US because of Obama administration funding cutbacks. AM: Apple famously touts its products as “Designed in California, Assembled in China”. This statement implies superior innovation power over Chinese counterparts. Yet with domestic Chinese businesses such as Tencent and Alibaba becoming more confident as innovators in their own right, what are the implications for Western businesses who have always felt safe in their role as the ‘innovators’ while using China as a factory? SR: For years the ‘Made in China’ label had negative connotations as being cheap, dangerous. For much of the market that is true but can no longer work going forward. The first half of my book is focused on innovation — the second half is looking at consumer trends and how Chinese are moving away from copycatting the western dream of beauty and life as they define the new Chinese dream. Importantly, there is a new found pride in Chinese-ness. Top Chinese firms like Xiaomi and Tencent are not hiding their Chinese heritage — Chinese consumers love it, support that move. For western companies, they need to understand that top Chinese firms are going to become global players competing on innovation and no longer the cheap but good enough positioning many Chinese companies competed with before. AM: Your last book devoted an entire chapter to the real estate industry in China. To what extent does your new book discuss this topic and what are the implications for real estate as China’s economy shifts from one of manufacturing to services? SR: Real estate plays a key theme in my book — including the high rents that are forcing retailers to think about e-commerce. The real estate sector in China obviously has some issues but they are not as serious as many analysts seem to fret. Prices might soften in the residential sector but there is little leverage in the marketplace. I am more concerned about some of the commercial developments that have gone up in the past few years because developers put too many Louis Vuitton stores as the anchors. The market can only sustain so many LV stores, especially with the anti-corruption crackdown. But real estate is actually pushing forward a lot of innovation. I had an interview set up with Zhang Xin the CEO of Soho but it got cancelled last minute so I wasn’t able to include anything on Soho in the new book. But pollution has become such a problem in China that it is developers like Soho that are investing in the newest forms of technology for cleaning air, reducing carbon footprints. Chinese real estate developers are really at the clean technology forefront. Thanks to Shaun Rein for taking the time to answer some questions for us. Please be sure to check out his new book The End of Copycat China.